Anyone traveling in Guyana will see animals. It's common to see farm animals along the side of the road. Cows and sheep wander freely, although the owners are generally aware of the location. Car drivers are responsible to approach with care. Like cars & buses, donkey carts are also used for transportation. "You can't even get a donkey cart license" is a common curse for a bad driver. The boys in a donkey cart above are waiting at the rice factory to buy a bag of mill tailings (bran) as animal food. Animals also offer a plentiful food source. 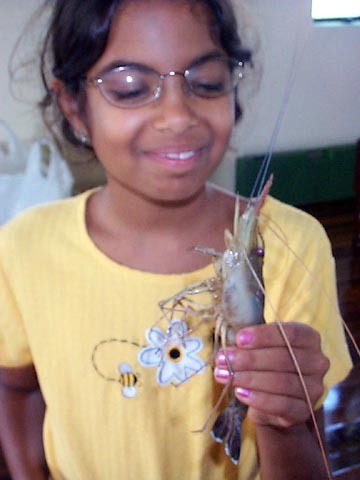 The fresh water shrimp shown above is huge! Duck hunting can also be rewarding. Although there are some wild life regulations, there's little or no resource for enforcement. Most people just take what they need. Wild meat is called "bush meat." Some bush meat, like that of a capybara, is absolutely delicious! Sometimes, a bicycle is the most reliable form of transportation. Although animals are used for transportation, they don't live forever. If you look carefully in the photo above, you will see a dead horse on the right side of the road. The horse dropped and wasn't moved for a few days...there just wasn't anyone available to remove the dead creature. Ironically, the dead horse was only 100 yards from the New Amsterdam hospital. There's an interesting zoo in the Botanical Gardens in Georgetown. Although the big cat doesn't have much space, the zoo offers an easy way to view some of Guyana's native animals. The zoo displayed numerous native animals like monkeys, panthers, fancy parrots and giant reptiles. The zoo also had manatees on display. 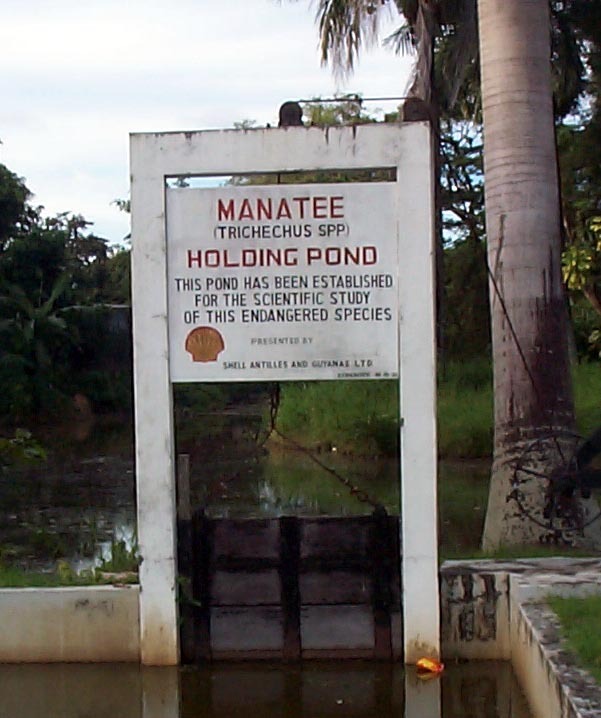 The manatee holding pond had about one dozen inhabitants who happily ate grass clippings. 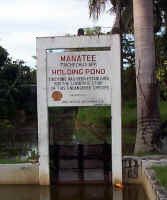 Manatees are protected. Historically, manatees, or sea cows, were a source of food. It's likely you can still find a place to eat curried manatee if you're persistent. Farm animals also play a big role in the economy. 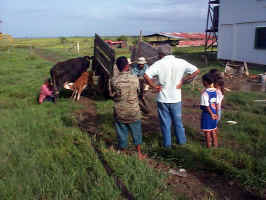 Above, a calf is taking milk from a cow giving the "first milk." This special milk is also being milked by a ranch hand. This "first milk" was later used to make a delicious Carmel candy served at a wedding. Ranch hands were also adept at catching wild creatures. On the right above, are some medium sized rattle snakes. Such creatures are common as dirt. 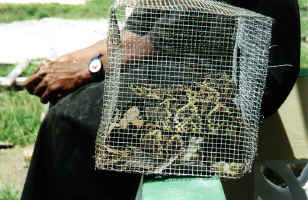 The ranch hands transported the snakes in the same truck as our luggage...we checked carefully before unloading! These same ranch hands would also small catch birds. They used a stick covered in "pitch" (gum) from a local tree. When a bird landed on the stick, it's feet would stick. Of course, you must retrieve the bird quickly before it's feathers become tangled in the pitch.